Millions of creatures live in our world, so fauna should be one of your main focuses when building a world. While it’s not feasible to populate your world’s many habitats with millions of species, understanding how creatures interact and evolve naturally will provide a useful avenue for design. Food chains and webs, animals populations, and evolutionary traits can diversify your world. Food chains and webs are networks used to describe predator-prey relationships in a given environment. For our purposes, they will dictate how your creatures coexist and interact with each other, hopefully opening up new methods of creature design. Food chains and webs are broken down into six trophic levels: producers, primary consumers, secondary consumers, tertiary consumers, apex predators, and decomposers. Earth’s food chains form an energy system, where the sun is the primary generator of energy and consumers are energy users. Due to the amount of energy the sun outputs, billions upon billions of producers flourish and become the supporting pillar of all higher trophic levels. However, consumers are not energy efficient when it comes to eating. Primary consumers are the most populous because they have a vast source of energy to draw from: plants. This energy inefficiency results in far fewer primary consumers than producers. Secondary consumers, now working from a much smaller pool of energy, cannot support as large a population as the lower levels. The same holds for tertiary consumers and apex predators. An ecosystem may contain thousands of species of producers, hundreds of primary consumers, tens of secondary consumers, and only one apex predator. A food chain must follow this model in order for an ecosystem to be stable and self-sustaining. Your world, too, should abide by this example. An ecosystem consisting of only apex predators would not last long; one species would eventually come out on top or they would too quickly consume the population of prey. In the end, the whole ecosystem would collapse. The main exception is an intelligent species. Humans are apex predators yet have a massive population compared to other high-level consumers. We make up for our lack of energy efficiency by using agriculture and animal husbandry to artificially increase the energy we can draw from. Your intelligent species, human or not, will do the same unless they find an alternate, sustainable energy source, or they may succumb to another apex predator. Knowing this, begin considering a food chain for your world. Start small and come up with a primary consumer. If you’ve already got some plants populating your world, think about what kind of creatures would eat them and how. If the edible vegetation is far above the ground, their consumers may be tall or have developed a way of reaching or climbing to the top. If the plants are small and difficult to find, the consumer will have a strong nose and possibly a way of digging the plant up, such as with claws, horns, or a pointed snout. Primary consumers will be your most diverse type of fauna so make a point of creating varying shapes and sizes. Just remember that the larger a primary consumer is, the more producers you’ll need to support it. Now consider secondary consumers to prey on your primary consumers. They’ll have to be faster, stronger, or smarter than the herbivores. Predators of larger primary consumers won’t be larger than the prey themselves, so smaller secondary consumers will have to work around their size disadvantage using methods such as pack hunting or wearing their prey’s stamina down. Smaller prey means the carnivores can be quick and powerful to kill in one attack or perhaps set traps for prey. Use these tactics to go back to your primary consumers and develop countermeasures, such as stealth, stronger senses, or a social nature. Tertiary consumers are a middle ground for design. Oftentimes what would be a tertiary consumer is an apex predator in its given food chain. Specialized design and direct weaknesses can play major roles here and make building them more enjoyable. If your secondary consumers are slow, a predator with precision and speed would be able to hunt them easily. If their prey has strong armor, a smarter tertiary consumer could break it with rocks or gravity. Apex predators are everyone’s favorite nigh-invincible killing machines.Consider, however, the amount of energy apex predators need to use and how sustainable that may or may not be. On Earth, the highest on the food chain is never the largest nor the most interesting in appearance. Many apex predators in media are designed with the mindset of form over function when in a realistic environment form follows function. In a realistic world, they should be designed similarly: built for energy efficiency and masters of only a few trades. Apex predators have very little need for defense as well, and any apparent defensive features or traits are caused by adapting to their environments. Evolutionary traits exist to promote the survival of a species. In a food chain, survival of the fittest is just that. Traits develop to assist lower trophic levels against higher, and vice versa. In other cases, they emerge as a result of mating competition, variations in the creatures’ environment, and changes in food sources. Adaptations can manifest in peculiar ways; look at desert horned lizards’ skin, owls’ asymmetrical ears, and the mudskipper’s amphibious limbs. Balancing evolutionary traits between your food chain is a game of back and forth with giving and counteracting. Camouflage is often the most noticeable trait when examining a creature. Various types of camouflage exist in the animal kingdom with methods such as countershading, masquerading, background matching, and more (Skelhorn and Rowe). Primary consumers exhibit these traits the most since avians are their main predators and rely on sight to locate prey. However, camouflage exists all the way to the apex predator level. Predators use it to approach prey, and prey use it to hide or disorient predators. When designing camouflage, keep in mind how secondary and above consumers locate their prey and design the level below to counteract that with camouflage. Blending in doesn’t always work, though. Higher level consumers often evolve to have stronger olfactory and auditory senses or develop ‘super powers’ to locate prey. Sharks, most notably the hammerhead shark, possess electroreceptors to locate other creatures only by the electric signals their muscles emit. Certain snakes have pit organs above their nostrils which essentially give them thermal vision to track nocturnal animals. Try giving one of your species an ability like this and design a food chain around it. Environmental effects appear on all trophic levels. In vegetation-scarce areas, primary consumers may adapt to become omnivorous. On Earth, no carnivore’s diet consists exclusively of meat; hypercarnivores’ diet consists of over 70% meat while hypocarnivores eat less than 30%. When creating secondary or higher-level consumers, try giving them a few characteristics of herbivores to reflect their dietary needs. Extreme environments bring out the most drastic traits in creatures. Arid-dwelling animals will develop water-conserving traits, ways to minimize contact with the scorched ground, or natural cooling. Polar conditions bring out heat conservation features, such as hibernation in bears, the thick blubber of seals and walruses, or the emperor penguins’ group huddle. Intense pressure on the ocean floor would kill any surface-dwelling animal instantly, yet some of the most interesting creatures thrive there. Designing organisms for these environments really lets you cut loose. A major exception to evolutionary traits are invasive species. Evolving in a foreign environment means invasive species must compensate for a lack of food sources. Some invasive species will die off if they do not adapt while others, such as the cane toad, thrive in their new environments. They can completely disrupt a food chain by consuming plants and animals that would otherwise be eaten by a native species, driving any apex predators out and replacing them or destroying an ecosystem in its entirety. Invasive species can render useless the defensive and offensive traits of native species. For you, these factors can serve as a challenging obstacle for characters in your world to face and a way to disrupt the order by introducing new predatory mechanics to an ecosystem. With all this in mind, let’s design some creatures. Design any non-decomposer organism. It can be as large or small as you want. Give it traits according to which trophic level you want it in. Knowing what environment you’d like the creature to exist in will help but is not necessary. Now that you’ve created one, consider the next level, whether above or below, in the food chain. How will this new creature hunt the first? What traits have each species developed to avoid and detect one another? Continue this process until you have at least one creature of each trophic level. Keep in mind that for every ecosystem, the higher one stands in the food chain, the fewer species at that level will exist. 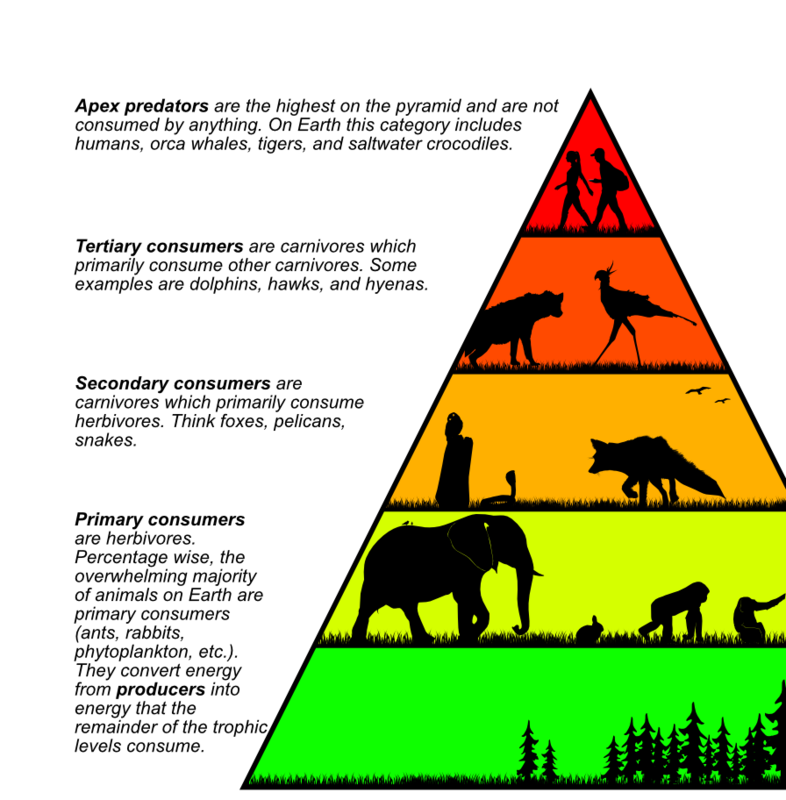 Think of it as a pyramid where primary consumers comprise the large base part and apex predators occupy the small point on top. Mutualism, parasitism, and commensalism are interspecies relationships which break the norm of the predator/prey chains. Creatures that might normally be eaten may be given a pass if they can provide some service to their predators. Mutualism allows cleaner fish to rid larger fish of parasites and bacteria in exchange for survival—both benefit from the interaction. Commensalism is a midway point between the other two, permitting one creature to benefit off the other without harming the other or giving it anything. Parasitism occurs when one organism gains off the others loss—think Xenomorphs from the Alien franchise. Use these relationships to help design a food web rather than a chain. Take the creature you made before, and think of a how a different creature would interact with it in both a food web and in one of the three relationships. This can lead to some interesting effects: multiple wasp species zombify other insects to make them hosts for larvae; birds can often be found on the backs of bison, cleaning the fur in exchange for protection and a free ride. When considering different interspecies relationships, try to briefly describe the interactions you want between your creatures before creating them. Doing so introduces variety in both function and form, keeping your animals interesting. Thinking of the creatures in your world as they relate to other creatures helps them feel cohesive with their environments. Designing with food chains creates a sense of independence from your influence and be more immersive for your audience.